New book, 105 pages, 153 photos, most in colour. AMX-13 In Lebanon. Multiple rusting and heavy weathering painting techniques for abandoned military vehicle models. 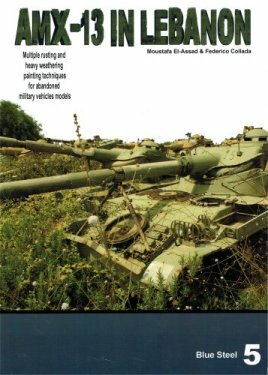 Chapters include The AMX-13 in the IDF, Lebanon army dump yard, AMX-13 Abandoned in Lebanon, Lebanon army dump yard 2, AMX-13 Rhapsody in SLA blue, Lebanese army live fire drill, Walkaround photos from a military museum.